“Coffee with Cops” is a community engagement opportunity for residents to get to know the officers working in their neighborhood. The primary goal of the “Coffee with Cops” event is to enhance the relationship between the Dallas Police Department and the residents of Dallas. 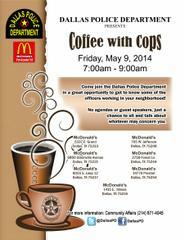 On April 6, 2013, the Dallas Police Department hosted their first “Coffee with Cops” at one McDonald’s location in the Southwest Division. With the success of this initial community engagement event, the department rolled out a second “Coffee with Cops” on December 20, 2013, which was held simultaneously at McDonald’s locations across all seven Patrol Divisions. “We thank McDonald’s for their continued support of our department’s community engagement initiatives,” said Dallas Police Chief David Brown. “Coffee with Cops further enhances the relationship between the Dallas Police Department and local residents,” said Brown. Such events provide an opportunity for informal and small scale interaction between the community and law enforcement, furthering Chief of Police David Brown’s community policing initiative. The Dallas Police Department invites all residents to attend one of the participating McDonald’s locations for the upcoming “Coffee with Cops” to meet with officers and receive a free cup of hot/iced coffee. Residents are encouraged to join the conversation online using the #DPDCoffeewithCops.